Furnish and Install rolling service doors as indicated. Doors shall be as manufactured by Mahon Door Corporation. Cutains are to be formed of (galvanized steel), (aluminum), (stainless steel) interlocking slats designed to withstand a windload of 20 pounds per square foot. Windlocks to be furnished where required by opening span, or for heavier windload requirements. Steel slats shall be galvanized per ASTM standards, chemically treated for paint adhesion. Both ends of alternate slats to be equipped with endlocks. The bottom of each curtain shall be reinforced with two (2) (steel), (aluminum), (stainless steel) angles of equal weight or extruded aluminum bottom bar assembly standard on all doors up to 16’-0” unless specified otherwise. Counterbalance Assemble shall be furnished with oil tempered helical torsion springs having a 25% safety factor. Springs shall be fixed to tapered cast anchors, mounted on a single steel torsion rod. Torsion rod to be attatched to a spring adjusting wheel, adjustable without removing the hood. Entire spring assembly to be housed in a steel pipe shaft of proper diameter and thickness so not to exceed .03” of deflection per foot of span. Braket Plates are to be of steel plate with sealed ball bearings to support counterbalance assembly and door curtain. Brackets to form end closures and support hood. Hoods shall not be less than 24 Gauge (galvanized steel), (aluminum), (stainless steel), contour to fit end brackets, and reinforced with stiffening beads at top and bottom edges. Guides are to be fabricated of (steel), (aluminum), (stainless steel) angles of not less than 3/16” thick. Depth of guides to be sufficient to retain curtain under windload specified. If windlocks are required, guides will be furnished with windlock retainers. Guides to be assembled with 3/8” bolts, bolted to jambs at spacings not exceeding 3’-0” on centers, bellmouths and door stops are incorporated into guide assemblies as standard. Operation is to be (manual, with lift handles), (hand chain and gear, maximum of 35 pounds of pull), (hand crank gear), (motor operator). Locking with provision for padlocks by means of (slide bolts on manual doors), (chain lock keeper for chain operated doors), (locking disc for crank operated doors), (self-locking gearing on motor operated doors), with chain lock for emergency hand chain. 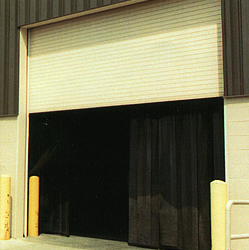 For more details on Rolling Steel Service doors call today 1-630-350-7667 or fill out our contact form.